The Kanagawa branch of the famous house of prostitution known as Jinpuro (新風楼 高島町, Nectarine) or No. 9, in Kanagawa (current Kanagawa-ku in Yokohama), Kanagawa Prefecture. 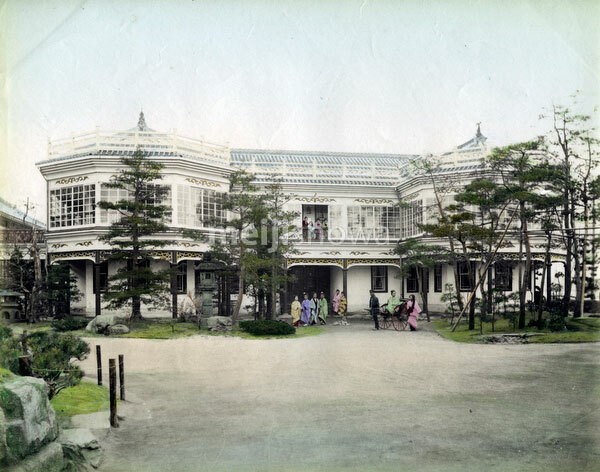 Jinpuro was opened in Yokohama’s Takashima-cho in 1872 (Meiji 5). In 1885 (Meiji 18) it relocated to the pleasure quarters in Magane-cho and Eiraku-cho (真金町・永楽町), while a branch for foreigners was opened in Nanaken-machi, Kanagawa (神奈川七軒町). The brothel ceased business after its destruction in the Great Kanto Earthquake of 1923 (Taisho 12).